WASHINGTON (AP) — A New York doll maker says it will be selling what it believes is the first transgender doll on the market. 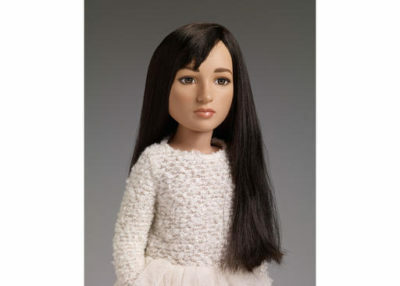 The doll is based on Jazz Jennings, the teenage transgender subject of the TLC documentary series “I am Jazz.” It will make its debut at the New York Toy Fair next week and be available on the Tonner Doll Co.’s web site and in specialty stores in July. A spokesman for the company said the 18-inch doll, which has a “genderless” plastic mold typical of most dolls, is being tested for kids aged 8 years and older and is expected to retail for $89.99. Tonner Doll, which is based in Kingston, New York, said Friday that the “Jazz” doll is being launched as a test for the specialty-retail market and will be sold by 25 to 50 stores. If it’s a hit, the company hopes to take it to the mass market. The doll was designed and sculpted by company founder Robert Tonner. His company has made dolls based on a variety of TV, film and book characters including Spiderman, Harry Potter, Dr. Who and Wonder Woman. “Jazz stands for everything I respect from a human nature point of view — she’s incredibly brave, intelligent, warm-hearted and creative,” Tonner said. She is the youngest person ever to be recognized in The Advocate Magazine‘s “Top Forty Under 40” annual list and was named as one of Time Magazine‘s Most Influential Teens for 2014 and 2015. In 2014, Jennings co-wrote a children’s picture book titled “I Am Jazz” and her memoir, “Being Jazz: My Life as a (Transgender) Teen,” was released last summer. The Jazz Jennings doll comes 40 years after the release of the “Gay Bob” doll, widely thought to be the first doll based on a gay character.